Sometimes I think I'm at my most creative the week before vacation. It's one of the few times when I diligently take stock of everything that I have in the refrigerator and pantry, and think of ways to use it all before we leave. The rush is not to use the things before they wilt and die, but rather to use everything period. I like to leave the fridge nearly clear so that there is no risk of anything going to waste in our absence, and so that we can start fresh upon our return. A few days ago, I was thumbing through the March issue of Real Simple magazine on the train home from work when I came across a nice looking tuna salad billed as the "brown-bag lunch of the month." The ingredients called for radishes, celery, parsley, and some seasonings; all ingredients which are usually rolling around my fridge begging to be used. I made a mental note to remember the combination of ingredients. I chopped the radish into little matchsticks and diced a whole red onion. I used four 5oz cans of tuna that I rinsed with fresh water first (if you don't like the "fishy" smell of canned tuna, that's a great way to eliminate it before using in a recipe. I zested and juiced an entire lemon, drizzled in some olive oil, and topped it all off with a shower of freshly cracked black pepper and sea salt. I skipped celery because I didn't have any, but I did add a heaping teaspoon of dried oregano. The finished salad is beautiful, with lots of green and gorgeous hints of red from the radish. I served it with toasted slices of whole wheat and pumpernickel bread and a little ramekin of mayonnaise on the side for spreading on the bread. I love the flavor of mayonnaise with my tuna, but I didn't want one of those heavy tuna salads we're all so accustomed to eating. This salad keeps well overnight, so--just like Real Simple suggested--it's a great one to try if you're looking for a healthy lunch option the next day. My recipe below makes about two to four servings, depending on how much you usually eat. Eugene, left to his own devices, would probably eat the entire bowl himself. And then ask for more. 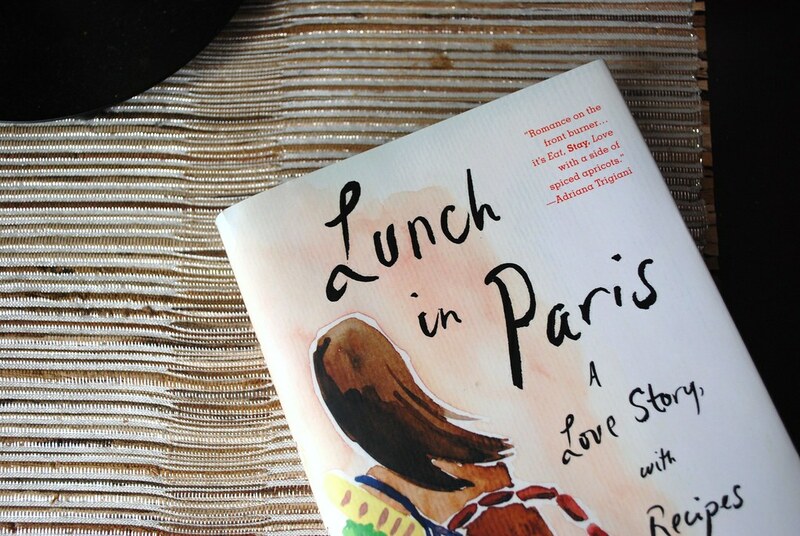 Speaking of lunch, I've recently become quite smitten with Elizabeth Bard's new book, Lunch in Paris (a love story! with recipes!). I devoured the book in two days and have been recommending it to everyone. I absolutely loved her writing and was actually sad when it ended. Those of you who loved Molly's A Homemade Life or Kim Sunee's Trail of Crumbs (another favorite!) should absolutely look out for it next time you're at the bookstore. In a large bowl, combine the drained tuna, julienned radishes, diced red onion, minced parsley, oregano, lemon zest, lemon juice, and olive oil. Toss to combine. Season with sea salt and freshly cracked black pepper to taste. Serve with toasted bread and mayonnaise on the side (mayonnaise can be spread on the bread or mixed into the salad by each individual if desired). Can be refrigerated in an air-tight container for up to 24 hours. Oh that's a gorgeous salad! Think I'm going to make this for my lunch today! Yum! That looks so fresh and lively! But I was wondering, did you mean "a handful of radishes", not "a handful of relishes", in the text! I very much don't intend to be rude, but I kept wondering when the relishes were coming into the recipe (I do love condiments :P) so wanted to check. And good luck getting on the plane - I hope all goes smoothly! love your recipes - and your philosophy! Glad you enjoyed the book. I love your book recommendations! You always share such cool books with us. I do the same before a vacation - using up everything in muy fridge before leaving. Actually I cook that way everyday as well. I base my meals on what's going on in my fridge and pantry so I usually have an exciting time planning what to cook with what I have around. Safe travels! Hope you have a wonderful time in the SUN. I'm so tired of all of this snow! 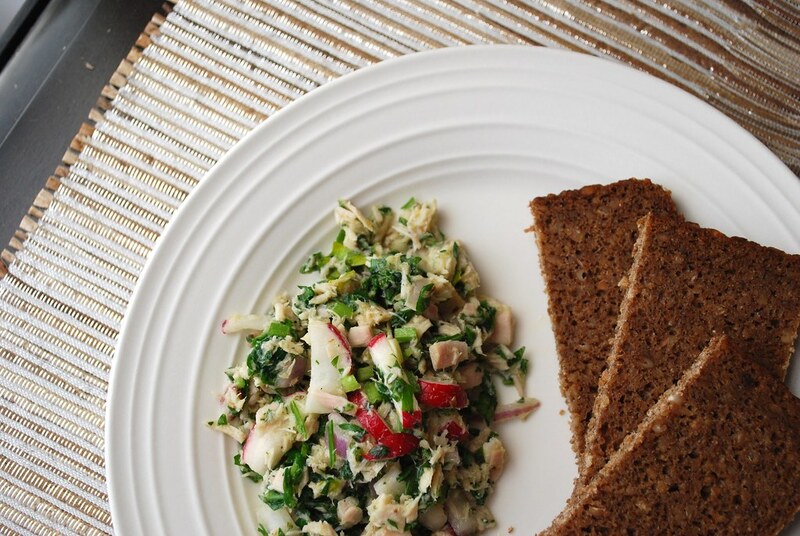 This tuna salad looks like a perfect, fresh way to chase away the winter blues. Lovely recipe. Great looking salad! I love Real Simple. I hope you have an awesome vacation! After reading this, I read your blueberry buttermilk cake post and I love the changes you made to that recipe from Gourmet. I agree with your feelings about buttermilk. It adds something wonderful to cake (and to biscuits, too)--texture, tenderness, moistness. Your blueberry cake just looks utterly divine, Alejandra. Hope you have a great time on your vacation! 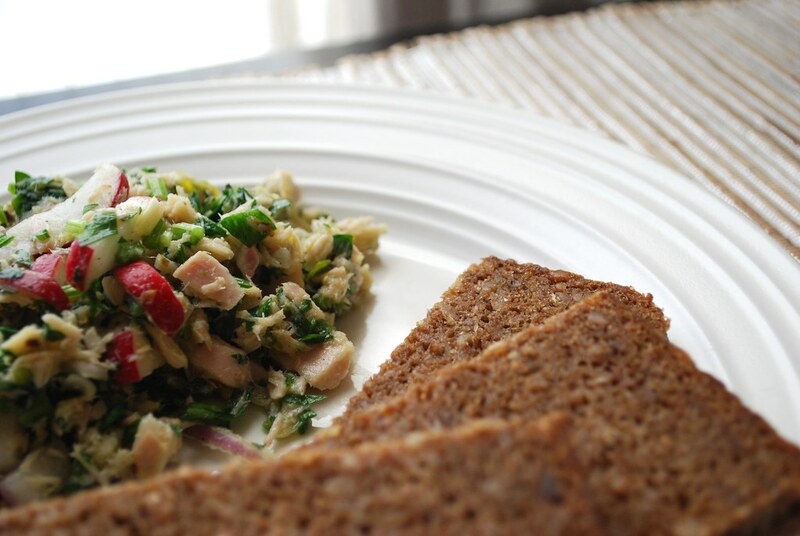 I am always looking for new things to do with tuna and this looks really good. I haven't had a chance to try it out but I will let you know when I do. This is my kind of tuna salad. Not too heavy on the mayo but more focused on light bright ingredients. I can't wait to buy this book. Have you read Amanda Hesser's Cooking for Mr. Latte I loved it! Oh, I've always been so intimidated by radishes :-( ....but your salad looks absolutely gorgeous, I should muster up the courage and give it a try really! I really admire your site.Lucky me,I have all the ingredients so I gave this a shot.Oh my,this is sooo good!My husband loves it too...we could eat this the whole day.Thank you for sharing this!